Peter Tatchell: Aleppo is today’s Guernica. Where is Labour? Syria Solidarity UK activists protested during a speech by Jeremy Corbyn at Westminster Central Hall on Saturday 10 December. I joined them. We urged the Labour Party to pursue ‘actions not words’ to save civilians in Aleppo and other Syrian cities. and for Syria to be suspended from the UN until it agrees to a ceasefire and stops blocking aid deliveries. Neither Labour nor Jeremy are actively campaigning for any of these initiatives. We urged Jeremy Corbyn to press for a parliamentary debate and vote to mandate UK aid drops of food and medicine to besieged civilians in Aleppo and other cities. He declined to give that commitment when I asked him. 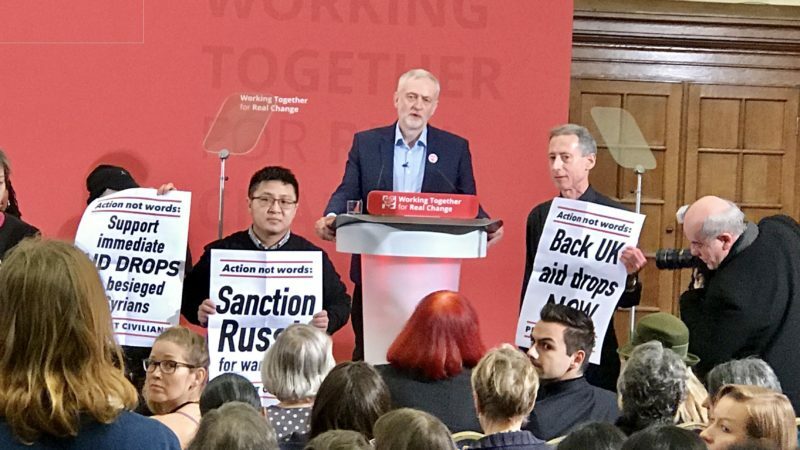 Jeremy’s speech rightly condemned Saudi war crimes in Yemen but made only a passing reference to Syria and offered no proposals to remedy the humanitarian crisis there. This has a whiff of double standards. What action has Labour taken to protect civilians in Syria? Nothing, so far. Labour has never organised even one event in solidarity with Syrian democrats, socialists and civil society activists. It is not listening to the appeals for action from democratic civil society activists inside Syria. We heard their cry for help and acted at their request. Our protest gave effect to their appeal for action. On Human Rights Day, Labour gathered to celebrate the noble sentiments in the Universal Declaration of Human Rights. But in Aleppo, the Syrian and Russian military are targeting fleeing refugees, children in schools, doctors in hospitals and civil rescue teams from the White Helmets. Hundreds of boys and men have allegedly gone missing from the areas seized last week by Assad regime forces. At least 100,000 civilians are being deliberately starved in Aleppo and a million others elsewhere in Free Syria. Labour must act, not just speak. So too must the Conservatives – and all parties. We call on Theresa May and Boris Johnson to also heed our call. We will protest against them in due course. There must surely be a cross-party consensus on humanitarian air drops. Why aren’t they happening? Labour should give a lead by initiating a House of Commons vote to make them happen. Aleppo is the Guernica of our age. Labour’s fine words need to be backed up with deeds. The Syrian civil war is one bunch of islamofascists fighting a slightly different bunch of islamofascists. We need to stay well clear of it. Guernica – a small city bombed with 800 dead.We killed several times that a night in raids in WW2 and 1,000 times as many with one atom bomb in Japan. It may resonate with those who are fond of political history but Guernica is not of any historical significance. Loss of life is inevitable in war. Whatever anyone may say, it has always been military policy to use civilians as military targets. From before the Romans to the Vietnamese war, civilians have always been targets. Starving populations into submission has always been used as a military strategy – by all sides. (We practised in the wars against France, the Boers, WW1 (Germany) and WW2 (Germany and Japan). So why should we intervene? CAN we intervene successfully? Can we overthrow Assad? Nope. Have we control of the air? No. The Russians do. Have we ground troops? No. The Russians and Syrians do. So we don’t control the ground, cannot fly safely and if we do support one side or the other we are supporting either a nasty dictator or a bunch of religious terrorists. Previous interventions in Muslim countries have been a monument to futility.All we have done is encouraged the spread of Islamic militancy.